The Cursed First Term of Zelda Stitch. Bad Teacher. Worse Witch. Imagine if you read your teacher's diary... and discovered she was a witch! 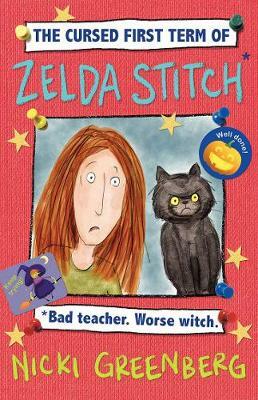 With courage, imagination and a certain amount of recklessness, Zelda Stitch begins her first year of teaching primary school - as an incompetent (incognito) witch. 'Zelda rides a broomstick!' 'Zelda's got a bat-friend!' 'Zelda smells like toadstools!' 'Witch! Witch! Witch!' It was bad enough when I was eleven years old. But if they sniff me out now, it'll be a disaster. Zelda Stitch isn't much of a witch - she's hoping she'll make a better primary school teacher. But if the vice principal finds out about her, her dream will go up in a puff of smoke. Keeping her magic secret isn't the only trouble bubbling in Zelda's classroom: there's wild-child Zinnia, lonely Eleanor, secretive Phoebe (who MUST be a spy for her aunt, the vice principal!) and a hairy, eight-legged visitor called Jeremy. Not to mention the nits...With NO HELP AT ALL from her disagreeable cat Barnaby, Zelda must learn to be a better teacher, a better friend and a better witch - even if that means taking broomstick lessons. From a house bursting with enchanted cinnamon doughnuts to a crazy collision with a giant inflatable slide, Zelda's diary of her first term is a cauldron full of laughs. Nicki Greenberg is a writer and illustrator based in Melbourne, Australia. Her first picture books, The Digits series, were published when she was fifteen years old. She later spent ten years disguised as a lawyer, while maintaining a not-so-secret Other Life as a comics artist and children's book author. Nicki is the creator of the award-winning 'staged-on-the-page' adaptation of Shakespeare's Hamlet, and of the graphic adaptation of F. Scott Fitzgerald's The Great Gatsby. Inspired by her own young children, Nicki has written and illustrated many delightful picture books for younger readers including The Naughtiest Reindeer series, Meerkat Choir, Teddy Took the Train, and Morris the Mole. In her Zelda Stitch novels, Nicki has come a step closer to realising her childhood dream of being a witch.